Fleas?! They've (literally) plagued humankind for centuries, but how much do you know about these common insects? Let's start with these 10 fascinating facts about fleas. During the Middle Ages, tens of millions of people died of the plague, or Black Death, as it spread across Asia and Europe. Cities were particularly hard hit. London lost 20% of its population to the plague in just two years during the mid-1600s. It wasn't until the dawn of the 20th century, however, that we identified the cause of the plague – a bacterium called Yersinia pestis. What does this have to do with fleas? Fleas carry the plague bacteria and transmit it to humans. An outbreak of the plague often kills a large number of rodents, particularly rats, and those bloodthirsty, plague-infected fleas are forced to find a new food source – humans. And the plague isn't a disease of the past, either. We're fortunate to live in an age when antibiotics and good sanitation practices keep plague deaths to a minimum. A common misunderstanding about fleas is that they lay their eggs in your carpeting and furniture. Fleas actually lay their eggs on their animal host, meaning if your dog Fido has adult fleas living in his fur, those adult fleas are doing their best to keep him infested with their offspring. Flea eggs, however, aren't particularly sticky or well suited for staying put, so they mostly roll off your pet and land in his dog bed or on the carpet. Without intervention, a few fleas on Fido can quickly become a maddening flea infestation that feels impossible to defeat. That's because fleas, like bed bugs and other bloodsucking pests, will multiply quickly once they've found a good host animal. A single adult flea can lay 50 eggs per day if it's well fed on Fido's blood, and in its short lifespan can produce 2,000 eggs. Fleas typically inhabit the fur or feathers of host animals. If they were built like most bugs, they would quickly become entangled. Flea bodies are quite thin and smooth, making it easy for a flea to move freely between pieces of fur or feathers on their hosts. A flea's proboscis, the straw-shaped beak that enables it to pierce skin and siphon blood from its host, remains tucked under its belly and between its legs when not in use. Remarkably, scientists estimate there are over 2,500 species of fleas on the planet. Within the lower 48 U.S. states, flea species number approximately 325. But when fleas infest a human habitation, they're almost always cat fleas, Ctenocephalides felis. Don't blame kitties for this annoyance, though, because despite their common name, cat fleas are just as likely to feed on dogs as they are on cats. Dog fleas (Ctenocephalides canis) can also be a pest problem but are mainly found on dogs that spend all or most of their time outdoors. Compression fossils from Inner Mongolia and China suggest that fleas pestered the dinosaurs, too. Two species, dubbed Pseudopulex jurassicus and Pseudopulex magnus, lived in the Mesozoic era. The larger of the two dino flea species, Pseudopulex magnus, was an impressive 0.8 inches long, with equally impressive mouthparts capable of piercing dinosaur skin. These ancestors of today's fleas lacked the ability to jump, however. Fleas don't fly, and they would never be able to catch your dog in a foot race (despite having six legs to Fido's four). So how are these tiny insects able to get around? Fleas are amazingly adept at flinging themselves into the air. Cat fleas, our most common flea pest, can propel themselves a full 12 inches forward or upward. That's a jumping distance equal to roughly 150 times its own height. Some sources compare this to a human landing a long jump of nearly 1,000 feet. In 1895, the Los Angeles Herald offered some "facts about fleas" to its readers. "The flea," the Herald writer declared, "shows a preference for women, children, and persons with thin skins." Thick-skinned men may have been offered a false sense of security by this column because fleas will gladly drink whatever blood is available to them. Fleas are sensitive to the vibrations that travel through the floor as people and pets walk through the house. They can also detect the presence of carbon dioxide we exhale. Should a sound or scent suggest a potential blood host is nearby, the hungry flea will jump in its direction, without considering first whether the host is a man, woman, or child. "Plague: The Black Death," National Geographic website. Accessed online October 18, 2016. "Plague: Ecology and Transmission," Centers for Disease Control and Prevention website. Accessed online October 18, 2016. 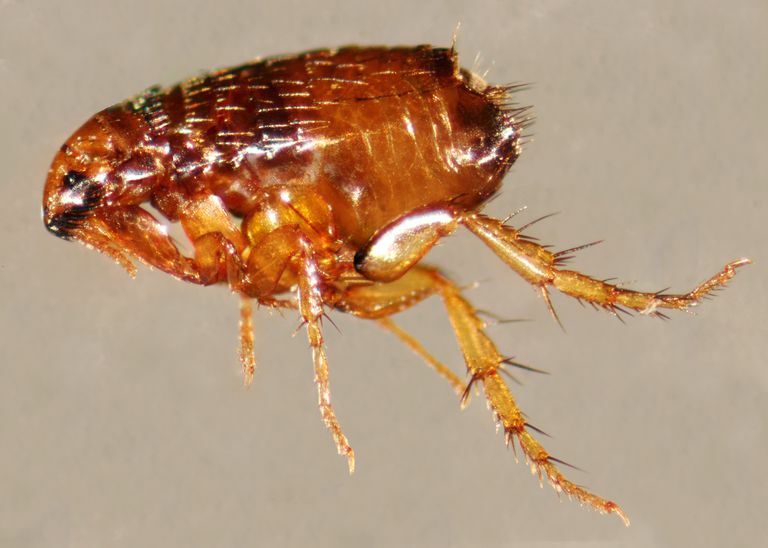 "Ridding Your Home of Fleas," by Mike Potter, University of Kentucky Department of Entomology, fact sheet #602. Accessed online October 18, 2016. "Some Facts About Fleas," Los Angeles Herald, Volume 44, Number 73, 23 June 1895, page 21. "Fleas," Purdue University Department of Entomology. Accessed online October 18, 2016. "Giant Bloodsuckers! Oldest Fleas Discovered," by Stephanie Pappas, LiveScience website, February 29, 2012. Accessed online October 18, 2016. "Monster 'Fleas' Put the Bite on Dinosaurs," by Jeanna Bryner, LiveScience website, May 2, 2012. Accessed online October 18, 2016.